(meth lab), or producing other illegal substances. pipes and even cigarette rolling papers. of a particular drug but that are usually not regulated. What is a Drug Forfeiture? It is also possible for the police and the prosecutor to file a separate forfeiture action. This is not a part of your criminal charges. Instead, it is a civil action in which the government is attempting to keep property or money they have taken from you. In some instances, a forfeiture action is actually used to gain title to your real estate. The basis of the civil action is their belief that your property (home, car, guns, electronics, cash, etc.) 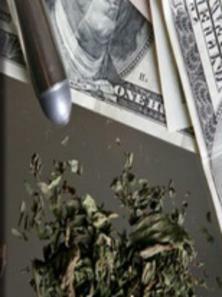 was purchased with drug proceeds or has been used in some way to advance the drug trade. When the police seize your property, they are required to serve a forfeiture notice. Our attorneys often object to the forfeitures but doing so requires very prompt action and the posting of a forfeiture bond. Typically, your failure to quickly and properly challenge a forfeiture waives your right to object. If that occurs, your property is considered to be forfeited to the government. A criminal defense lawyer can assist you with a civil forfeiture action separately or in addition to any criminal representation. Drug charges have severe consequences, including significant fines, forfeiture of property, and incarceration. As with many other serious crimes, if you are under investigation or arrest on a state or federal drug charge, do NOT volunteer any information to the police other than your identifying information (name, address, and phone number). Tell the police you wish to remain silent. Tell the police that do not want to talk to them without first consulting your attorney. Don’t give permission to search. Even if you are stopped in your car, and police officers find drugs or other drug paraphernalia in the vehicle, do not say anything about their findings. Never voluntarily consent to the cops searching you, your car, or your home. Remain polite, but insist on speaking to your attorney immediately. And of course, never, ever resist arrest, obstruct a police officer or run from the police. Doing so can add additional charges and make your situation even more difficult.